Something curious is going on in Cross River State, some obviously sponsored youths have been induced to carry out "protest rallies" against the face and moving spirit behind the agitation for the resettlement of the displaced people of Bakassi. Apparently the young protesters phantom angst is that Senator Florence Ita-Giwa is really not from Bakassi and should stop misrepresenting them. It is the height of insult to a woman who, on record, was born in Atabong, Bakassi. It is also a funny assertion coming 30 years after Ita-Giwa almost single handedly brought the plight of the Bakassi people to the front burner of national discourse. All of this is coincidentally taking place just after the Senator decamped from PDP the ruling party in the state and declared for the APC, the government at the centre. Anyone who has followed Ita-Giwa's political career knows she likes to play with the government at the centre. Thus, any discerning person can see that something sinister is afoot. Those in the know reveal that the problem started with a fire outbreak at a Bakassi displaced persons location. 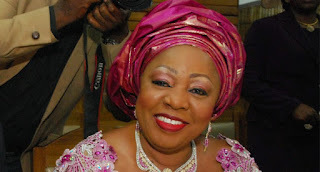 Senator Ita-Giwa was said to have gotten the National Refugee Commission to promptly respond to the disaster. The Refugee Commision mobilized considerable relief materials in the form of food and building materials which was handed over to the state government at a ceremony in Calabar. However, the relief materials never got to the affected victims of the fire disaster but instead found its way into the open building materials market in Calabar. The obviously miffed Senator Ita-Giwa then reported to the authorities in Abuja, who dispatched some security personnel to look into the issue. Their findings revealed that there was indeed a diversion of relief materials. According to Prince Paul Nsan, National Coordinator, Renaissance Group Caucus, the hate campaign against Ita-Giwa may have been masterminded by the state government that feels embarrassed instead of taking responsibility for the situation. The government has allegedly decided to demonize Senator Ita-Giwa for having the temerity to expose the farce. Hence the sponsored protests against her. But this is not the first time, Ita-Giwa is rising up against suspected crooks who want who are feeding fat on the misfortune of Bakassi indigenes. In May 2010, there were rumours that funds were missing from the account of the Bakassi Resettlement Committee, chaired by Ita-Giwa. She promptly asked the Economic and Financial Crimes Commission to investigate the matter. Nsan expressed fears that the current protests might incite a misguided youth to take matters a step ahead by physically attacking the senator. God forbid that she should be assassinated as was the case with a British female member of parliament a few years ago. He called on the PDP controlled Cross River State government should concentrate on governance and find ways to pay the backlog of salaries they owe workers rather that squandering scarce resources on mobilizing youths against Eka Iban Ke Efik Eburutu, the Mother of the Efik Kingdom. Let it be known that nothing must happen to Senator Ita-Giwa.